We teamed up with Bravo Top Chef and Bravo TV to create some southern inspired sweets to celebrate of the new season of Bravo Top Chef based in Charleston. We had Amanda Frederickson (feedfeed editor) make his Bourbon Spike Pecan Pie, because let's face it, everything is better with Bourbon! Catch Bravo's Top Chef every Thursday at 10/9c - only on Bravo. Want to make it? Check out the recipe & a video tutorial below! Tip from Amanda: My recipe calls for 3 cups of pecans. I was using a normal Pyrex pie plate. However since pie plates tend to vary in size and depth, the best way to tell how many cups of pecans you need is to fill your pie plate with pecans when it is empty. Fill it full but not overflowing, knowing that the filling will expand a little when baking. I do this with a lot of my pies so I know how exactly much filling to make. When ready to make the pecan pie roll out 1 of the rounds of dough into into a 12" circle, about 1/8" thick. Using your rolling pin, carefully transfer dough to pie dish. If making the leaf design, roll remaining pie dough out to a 12" circle, about 1/8" thick. Carefully punch out leaf decorations (or decoration of your choice) and place cut outs on a parchment lined baking sheet. Place both the pie dish with the rolled out dough and the leaf cutouts in the refrigerator for at least an hour. Blind bake the pie crust by covering with tin foil, filling with pie weights and baking for about 15 minutes. Carefully remove pie weights and cook for another 5 minutes or until golden brown. Let crust cool to room temperature. In a large bowl combine the eggs, brown sugar, both corn syrups, butter, bourbon, vanilla and salt. Stir well to combine. Fold in 1 1/2 cups of the pecans. 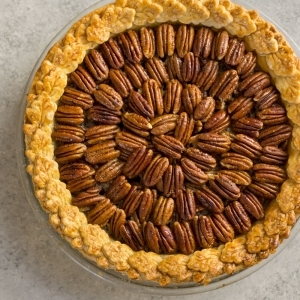 Pour pecan filling into pie crust, then arrange the remaining 1 1/2 cup of pecans on top of the filling, starting from the outer edge, working your way in. Bake for 50 to 60 minutes or until golden brown and when a knife is inserted into the middle it comes out clean. Let cool to room temperature and serve with whipped cream.